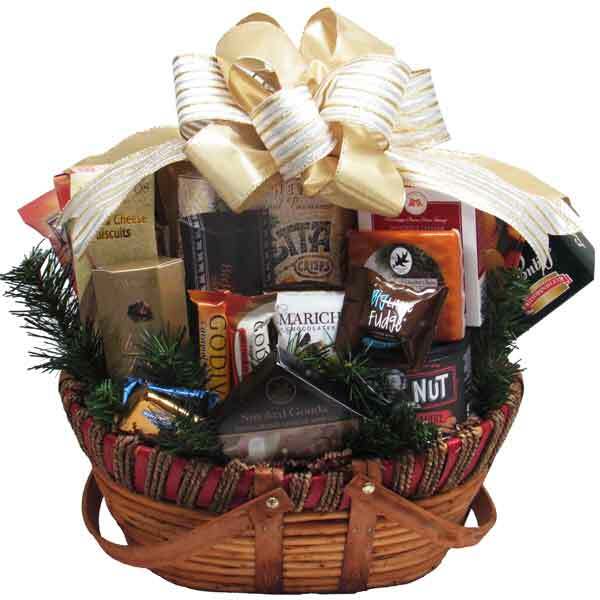 This beautiful wood with braided rope basket with drop down handles is filled with lots of gourmet goodies! Filled with Chocolate Truffles, Ghirardelli Chocolate Squares, Cheeses, Godiva Chocolate Bar, Natural Hickory Smoked Sliced Summer Beef Sausage, pouch of Basil & Garlic pitted Olives, box of Nuts, Toblerone Swiss Milk Chocolate Bar, Bourbon Pecan Cordial Cake, All Beef Summer Sausage with Cranberries, Wine & Cheese Biscuits, Parmesan Bruschetta Crisps, Wild Smoked Salmon, flavored Gourmet Popcorn (Almond Pecan Crunch, Cranberry Walnut Crunch, or Dark Chocolate with Sea Salt), two (2 different flavors) boxes of Lady Walton Chocolate filled Butter Wafer Cookies (Dark Chocolate Raspberry, Dark Chocolate Orange, Chocolate Mint, or White Chocolate French Vanilla), box of Monet Crackers, two (2 different flavors) Pretzel Twists (Smoky Barbecue, Salted Caramel, or Cheese Pizza), two (2) Fudge Bites (Chocolate and Chocolate Peanut Butter), and box of Focaccia Cracker Crisps, all nestled in silk evergreens for a seasonal look. Wrapped in crisp clear cellophane and topped off with a big beautiful handmade bow. Includes a Handwritten Greeting Card. Finished decorated design for hand delivery approx. 20"h x 15"w x 11"d. For shipments, this will be designed lower in the basket, shrink-wrapped, and topped off with a smaller bow. NOTE: A few items were discontinued that were in the photo. The list above is what will be in the design. Nuts, Cookies, and Popcorn from Dallas area companies. Cake and Fudge from Texas companies.